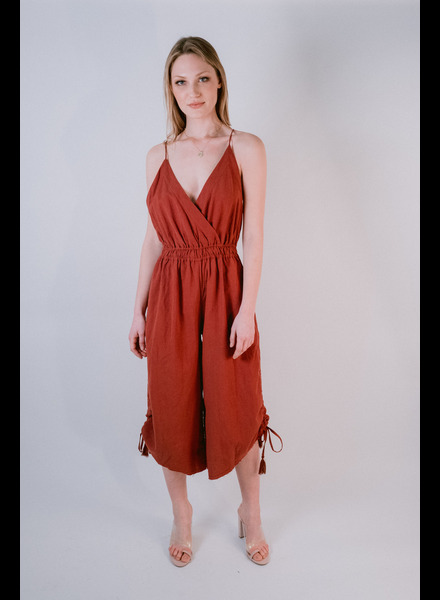 Rust linen harem style jumpsuit wtih leg pull ties. Model is 5’9” and wearing a size small. Strappy back black jumpsuit. Fully lined. Model is 5’8’ and wearing a size small. 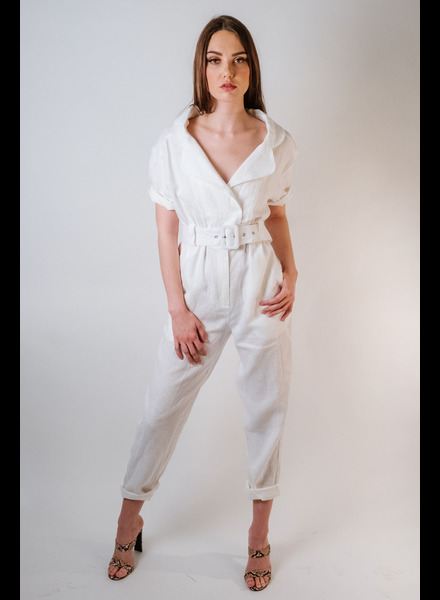 White short sleeve cropped leg collared jumpsuit with belted waist detailing. Model is 5’6 and is wearing a size small. Pink linen rouched off the shoulder romper. Model is 5’7” and wearing a size small. Spring pink long sleeved utility jumpsuit with silver snap buttons. Model is 5’6” and wearing a size small. Abstract tropical print wide leg, boxy jumpsuit with tie back straps and side pockets. Model is 5’6” and wearing a size small.